If your cats like to chase small flies, bugs and colorful moths, this is the kit for them! 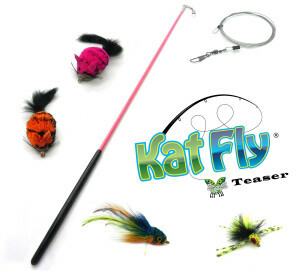 KatFly® Cat Toy Teaser Wand with 4 bug like Attachments. 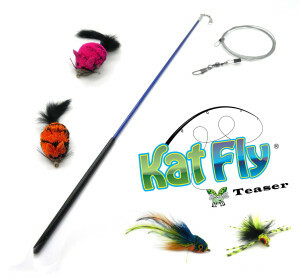 Attachments are the Orange tiger mouse KatFly® Teaser, Pink Tiger mouse KatFly® Teaser, Blue swimming Frog KatFly® Teaser, and Bugsy KatFly® Teaser. Recommend supervised play time with cats and this toy! I got this for my cats for Christmas and they all love it! The line gives it the perfect "action" in its movement so that it flicks and flutters - it's like fly fishing for cats instead of fish. Two of my cats like to chew on the teaser line more than they play with the toy on the end - but unlike the typical nylon that's used on other ones, they can't bite through this one. This is so much better than those wands with the fleece material strings - at least for my cats. The interchangeable "lures" are especially fun for the cats. All I have to do is pick this thing up and my napping cat will come running, he loves it that much. He's dragging the whole thing around the house right now, ha! Cats' favorite Christmas present yet. Two thimgs to keep in mind. It is possible with any of these teaser toys with string, nylon, or coated wire lines to get inadvertently wrapped around a cat's neck or leg. That's a quick fix if you're there playing with them, but they can do it on their own as well which could be dangerous, so I recommend putting it away when you leave or go to bed. I have to actively hide it rather than just putting it on a shelf because my cat who loves them the most watches where I put them. He got it down from a bookshelf once after he saw me put it there! And two, I'm giving this a 4 star instead of 5 because I'm waiting to see how the hooking device for the toy attachment holds up. It came uncooked once and was catching on a rug. Hopefully it was just a fluke and will stay hooked.